Sunday's are for brunching here in Charleston and there is no shortage of excellent places to go. Today I want to share with you a favorite of ours, a place that I feel is a little hidden gem — Angel Oak Restaurant! We tend to frequent this place when Whit's parents come in town. It's a small, quaint little spot, with a rustic and cozy setting, located on Savannah highway near John’s Island. Think good southern comfort food made with local ingredients. From country fried steak, to beignets and eggs benedict, their menu has something that will satisfy all your cravings.They serve lunch, brunch, and dinner, with weekly specials such as a prix fixe menu for dinner on Tuesday's, Wednesday wine specials, and bottomless mimosas on Sunday. Their brunch is my favorite! 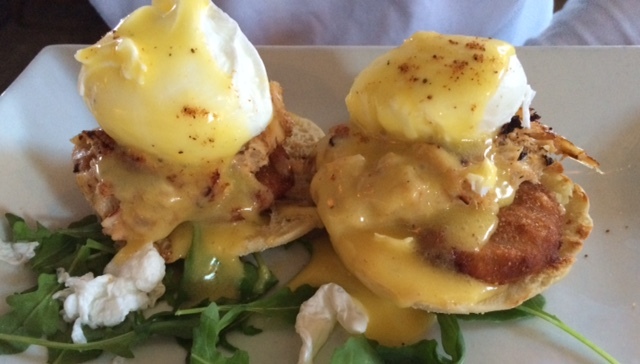 I'm a lover of crab cake benedicts and theirs is hard to resist. And if you're an indecisive person like I am, the trio of benedicts is the way to go. One Low Country benedict, which comes with a crab cake and friend green tomato, one regular egg benedict, and one country fried steak and egg. What more could you want?! Oh and don't forget to order a plate of their house made beignets! 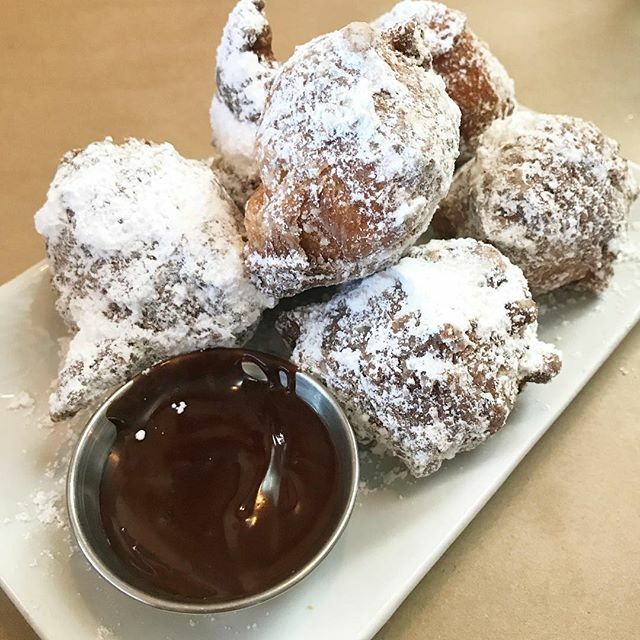 Dusted with powdered sugar and served with chocolate dipping sauce, they are worth every calorie! I'm getting hungry just thinking about all of this food. They also offer specials, like these delicious crepes, stuffed with lemon mascarpone cheese, drizzled with honey. If you ask me, this needs to be added to the menu permanently. 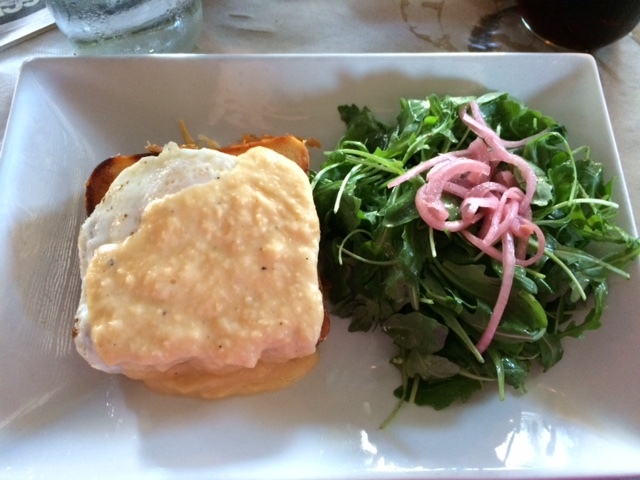 If you're looking for something a little more savory, the Croque Madame is an excellent choice. This toasted ham and cheese sandwich is topped with a fried egg, finished with mornet sauce and served with an arugula salad. It's also another favorite of mine. Speaking of favorites, I don't have a photo of the pimento cheese grits, but...pimento cheese, need I say more? You can't go wrong with anything at this place. Angel Oak Restaurant is also just seven miles away from the beautiful, historic Angel Oak tree, so you can have brunch and do some sightseeing. Sounds like a perfect afternoon to me. Where are some of your favorite brunch spots in Charleston? This is my kind of brunch, oh em Im starving!